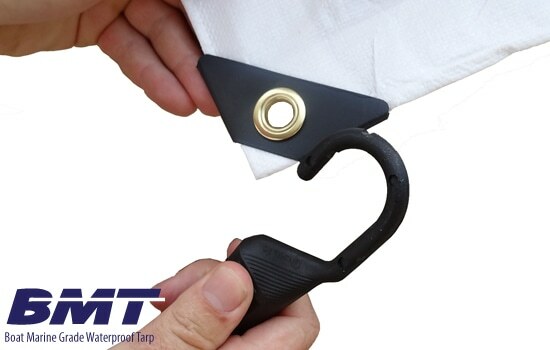 Boat Tarp Cover - Completely waterproof tarp that installs easily on most styles of from bass boats to v hulls. 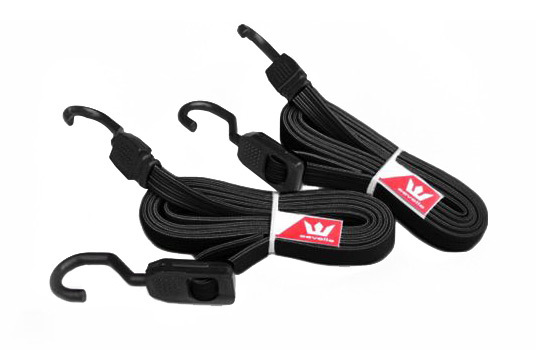 Quick and easy to install. Provides excellent coverage. 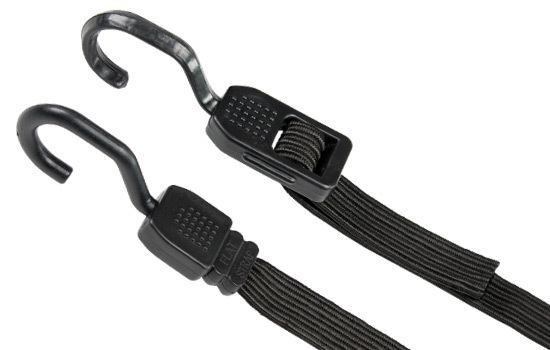 Easy to use 3/4" flat bungees with rubberized hooks will not scratch your boat. Fits Over All Accessories - Seats, Cabins, etc. 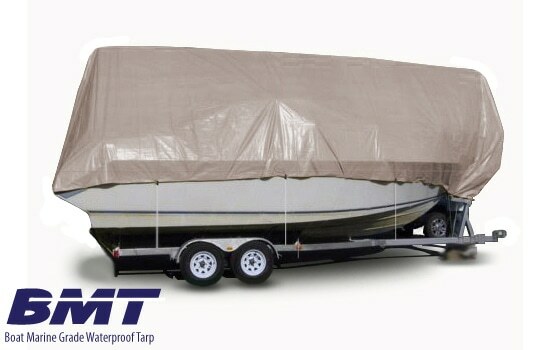 This Boat Marine Tarp is specially designed to keep your boat waterproof and cool unlike many standard poly tarps. These heavy duty, outdoor boat tarps can endure all weather systems and high levels of wear and tear, but are uniquely suited for situations that require a bit more waterproofing. 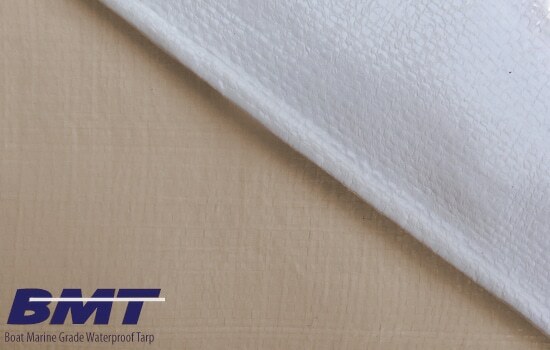 Our BMT tarps are constructed from thick polyethylene and contain a 12 x 14 mesh count, allowing for the right blend of coverage and breathability. These poly tarps resist mildew, acid and mold build up by letting a small amount of air to pass through, helping keep your vehicle completely clean and dry. These tarps are also UV treated with our Durapel weather finish to protect your roof from harmful sun rays that can cause fading, cracking and warping. 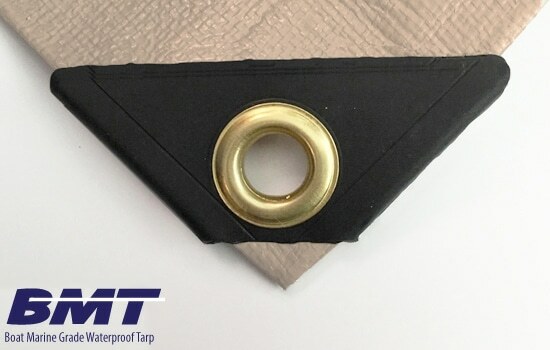 Each BMT tarp is fashioned with grommet tie down points that are 18 inches apart, plus reinforced corner guards for long-term durability. The 1,200 denier count material promises to deliver arctic flexibility, so it will function well in freezing temperatures and blistering heat. 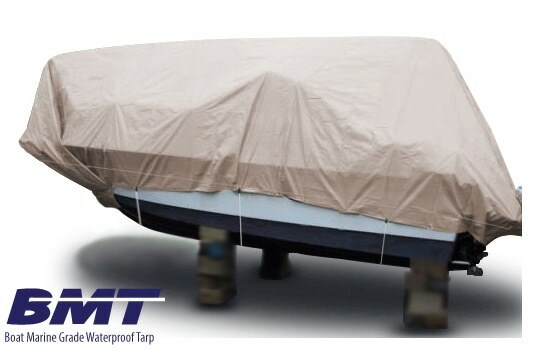 The BMT Tarp is designed to fit many styles of boats including bass boats, V hull runabouts and performance boats. A quick and fully waterproof cover up has never been easier! Fits easily over all accessories - seats, cabins, etc.